This innovative mount from Xenta can house two monitors and a laptop. The flexibility it offers makes it ideal for the office, study or games room. The mount can hold two monitors of up to 32" and a laptop with a screen size of 10-15.6". The mount can be attached to your desk via the supplied grommet or clamp. Either method will provide a secure and stable base for your combined monitors and laptop workstation. The gas sprung monitor arms and built-in spring gauge perfectly counterbalance the weight of your screens. This makes them stable and easy to position. The 360⁰ rotary VESA plate enables each monitor to be positioned either vertically or horizontally. Why use a monitor mount? More of us are using monitor mounts as we realise the importance of positioning our monitors at a level which is comfortable. Experts tell us the best way to view a monitor is around about eye level and using a desk mount is an ideal way to elevate the screen to the right height and angle. Using this Xenta mount will help prevent eye strain and neck pain, as well as being far more comfortable to work with. Especially when the user is sat in front of their monitors for extended periods. The laptop holder is made from steel and the special ventilated design allows extra air circulation. Laptops of varying sizes from 10-15.6" and weight of 4.5kgs can be accommodated thanks to the adjustable side clip. When mounted your laptop will be securely held in place by the safety ledge stopper. Xenta produce a whole range of products and constantly deliver high-quality tech that is both reliable and affordable. 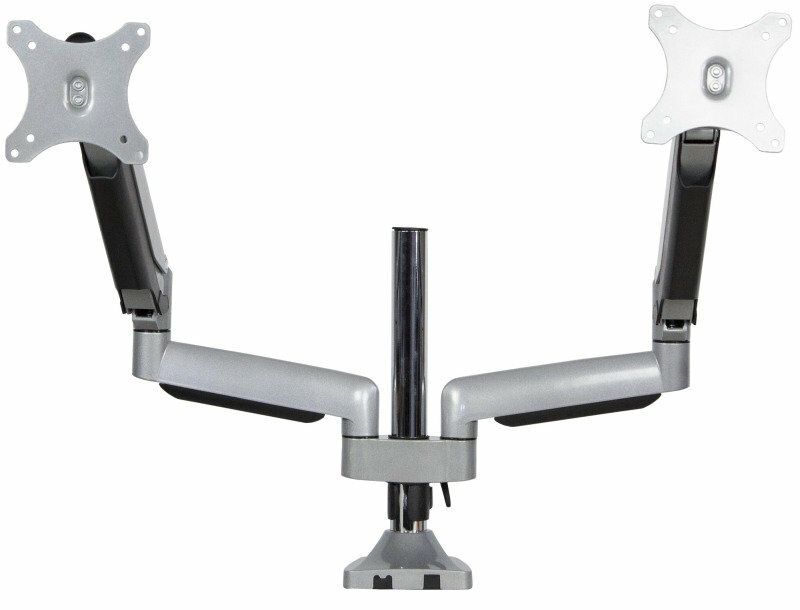 This desk mount is expertly engineered and is able to accommodate monitors of 13-32". VESA 75x75 / 100x100 compatible and able to take a combined load of 1-9kg. Making this mount suitable for most monitors. The mount is quite straightforward to set up and once attached the position of the monitors can be changed to find the optimum viewing angle. This versatile mount also comes with a built-in cable management system to help keep your desk free of wires.